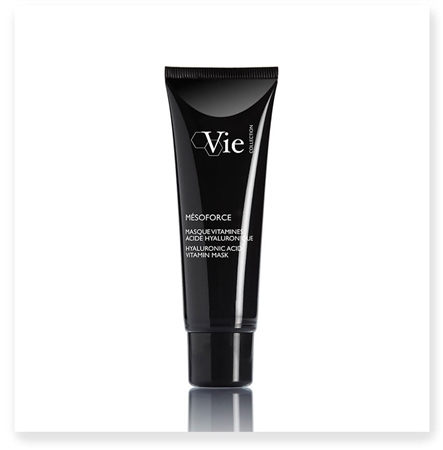 MÉSOFORCE takes its inspiration from mesotherapy to visibly revitalize the skin. Its formula contains a cocktail of vitamins and hyaluronic acid to reveal, upon application, hydrated skin and a radiant complexion. With each application, skin is visibly smoothed and plumped. Apply a medium layer of mask to the face and neck, avoiding the eye contour area. Leave on for 10 minutes, then rinse. For optimal effectiveness, use twice a week. Tested under dermatological control. HIGH MOLECULAR WEIGHT HYALURONIC ACID: intensly rehydrates the skin. ENCAPSULATED HYALURONIC ACID: fill deep wrinkles. VITAMINS C, B5 AND E: cocktail of vitamins to smooth, hydrate and revitalize the skin. In 2 weeks, skin is smoothed, ideally moisturized and plumped. The complexion is fresh, as if energized.